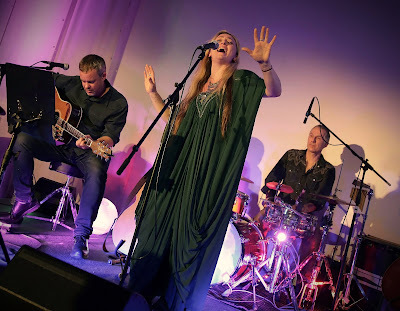 The refined surroundings of the Bartorelli Room at the Bridgewater Hall were a fitting location for Little Sparrow's long-awaited return to the Manchester live scene. Armed with a set containing a number of new songs and performing three tracks with pianist Robin Dewhurst from her recent Just 3 collaboration, she received a well-deserved standing ovation at the end of the hour-long set. It's been four and a half long years since the release of Little Sparrow's debut album Wishing Tree and like any struggling independent artist life can often get in the way of spending both the time and money required to produce music. Her recent Just 3 collaboration with Robin Dewhurst came about as part of an event in the Tim Peaks Cafe at Kendal Calling where they performed a cover of Madness' Baggy Trousers. That rejuvenated Katie (Little Sparrow)'s appetite and the result is a series of new songs that she alludes to forming part of a new album. She sets her stall out early with Alone, an expansive more ambitious song than anything she’s performed before, taking dark dramatic turns prompted by Sarah’s cello and Mitch’s percussion. That drama allows her to act out the song and the lighting that makes this more of a theatrical performance than a gig simply adds to that as her voice dances through its many ranges, one minute high-pitched, the next deep and unnerving. The intensity of it is such that Katie jokes a couple of songs later that she should start with slow ones. She declares that she’s going to mix the set up a bit as it’s her first Manchester show for a long while, but Polly is an old favourite before she does and the audience is held in the grasp of the interaction between voice and cello once more. Garden and Memories Maid might have been b-sides of singles from Wishing Tree, but only in the sense of when they were recorded. Both songs are more fragile and hence emotionally wraught than the singles they accompanied but feel like perfect choices for the occasion. Mitch and guitarist Jonny Lexus leave the stage as Robin Dewhurst is invited up to take his seat at the piano for the now trio to perform the tracks from their Just 3 collaboration. First up is the Madness cover Baggy Trousers and Katie explains how she originally baulked at the suggestion of the song as it has no melody before Robin’s slowed down interpretation won her over. Like any cover version worth its salt it reinterprets not photostats the original creating a very different perspective of reflections on time at school. Tender was a song Katie wrote about her mum when she was ill and she explains how it took a long time before she could sing it. To assist in that process she made a video of loved ones that people sent into her after an internet request. As the video plays on the big screen behind her, including images sent by people in the room, it feels like we’re all magically connected by the sense of helplessness and loss that such situations create that Katie has distilled into a song. Dry Your Eyes, the EP’s third and final track, is similarly intense but cathartic, an encouragement to pick yourself up, dust yourself down and keep fighting. Eschewing many fan favourites from Wishing Tree, Katie treats us to three insights from her next record that’s in progress. Old News takes aim at the here today gone tomorrow nature of society. She introduces Corner Of The Room as her attempt at writing something commercial, a song about a spider that builds, ebbs and flows beautifully without ever sounding as contrived as her introductory statement would suggest. It’s the sound of Little Sparrow’s wings growing stronger and taking flight as evidenced by her stage persona which has become more confident and outwards looking despite her long absence from the stage. The camaraderie between her and her long time stage partners Sarah, Mitch and Jonny really shines through on the newer songs as if they’re refreshing and revitalising the working relationships and on-stage chemistry, particularly when she playfully jibes at Jonny for his reticence to dress up for videos. The final new song is one written by Katie’s Dad that he used to sing to her to make her sleep as a child, typical of the intensely personal nature of her work that makes connections with her audience as the emotions and experiences are relatable. The more fragile moments and the exquisite sound of the Bridgewater really accentuate the clarity, depth and range of Katie’s voice and the response of the audience is suitably appreciative. There’s still room for some old favourites though. Katie invites Elfin Bow, whose opening slot we sadly missed, up to sing on Struck Gold, to which we’re encouraged to add harmonies which we do without tainting Katie’s vocals. It’s a song that has grown finer with age, it’s “I’m already home” a plaintive yet all-telling conclusion to the celebration of finding “the one.” The main set finishes appropriately with the title track of Wishing Tree, the cello leading the dance throughout. There’s no way the audience is going to let them go before an encore and it’s a surprising choice, the album’s closing track The Swallow Flies that brings the evening to a magnificent end. Tonight felt like a rebirth for Little Sparrow and a huge step forward. Shedding the comfort blanket of songs like the majestic Sending The Message and revealing the new material was a brave move after so long away but one that pays dividends. Her new material feels like a massive progression, retaining the intimacy and poignancy of her debut but delving further into the human condition through her own experiences and giving opportunities to expand on the possibilities of her showstopping voice. Little Sparrow's website can be found here and she is also on Twitter and Facebook.